It can be overwhelming for even the most advanced yoga student to be able to understand the differences between the vast array of hatha yoga styles from which to choose, the different class levels and even the types of classes offered. Here's your cheat sheet. Styles of Yoga - Click here for an overview of Hatha, Vinyasa, Anusara, Power & other class styles. Levels & Types of Yoga Classes - Click here to better understand the difference between the various class levels (level 1, mixed level and more) as well as an overview on gentle, restorative, meditation, pranayama and other types of yoga classes. With so many yoga styles and levels to choose from, it can be intimidating to know where to start. A Beginner, Gentle or Basics class (in that order) is a great launching point. The pace of all three of these classes is slower so that you have time to learn the positions. Whichever class you do attend, remember that yoga is for every BODY. Whatever is going on in your body – aches, extra weight, lack of flexibility, fatigue, stress – rest assured that yoga is perfect for you. The best way to approach yoga is with an open mind and heart, mindful presence, non-judgment, non-competition and self-love. The beautiful part about yoga is that every moment on your yoga mat is an opportunity to cultivate these qualities. Yoga will meet you wherever you are emotionally and physically. 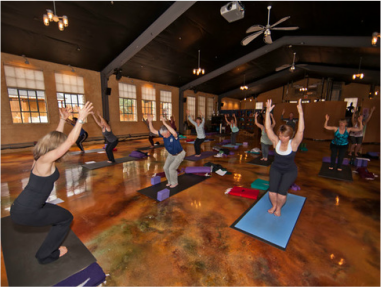 A great rule of thumb is that you should always leave a yoga class feeling better than you did when you walked in the door. Enjoy! Click here to return to Yoga 101.